Proper lighting is important because it makes all tasks easier. 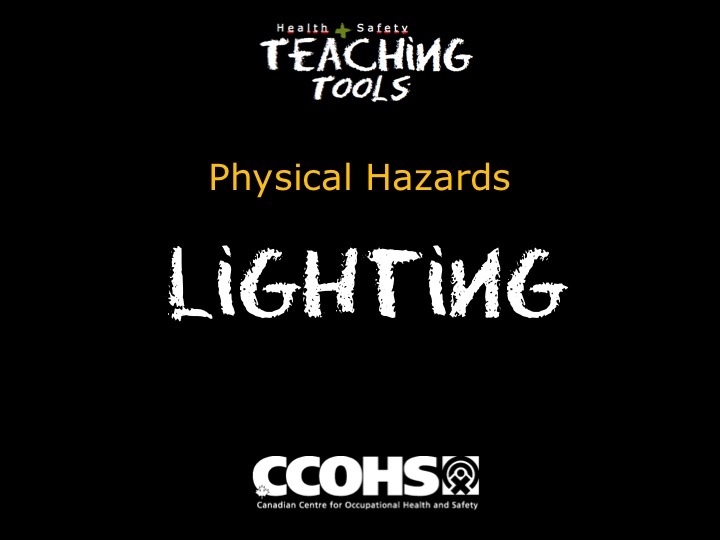 When lighting levels are low, too high, or inconsistent (shadowy), our ability to complete tasks safely is compromised. This is because our eyes get tired and/or sore, which can lead to headaches and work mistakes. 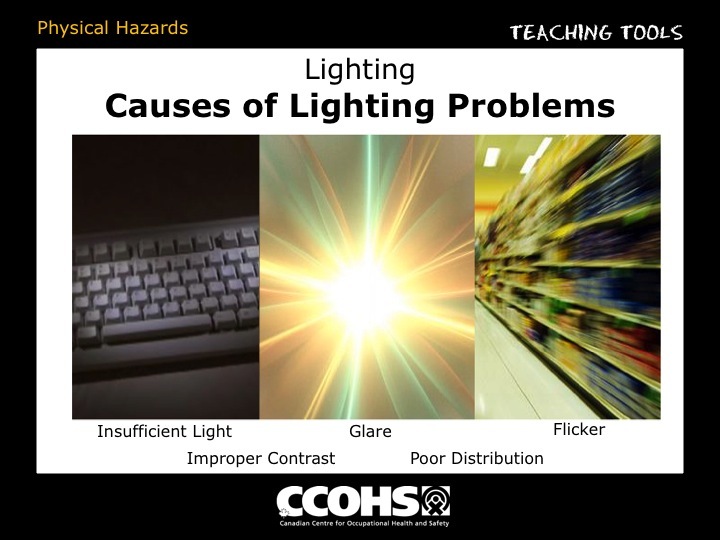 Furthermore, improper lighting can make it difficult to make appropriate judgements regarding footing, placement of materials, and timing when moving materials, tools, or equipment is being used. There are two types of glare; direct glare and indirect glare. Direct glare occurs when a bright light source is directly in the field of vision of a worker. 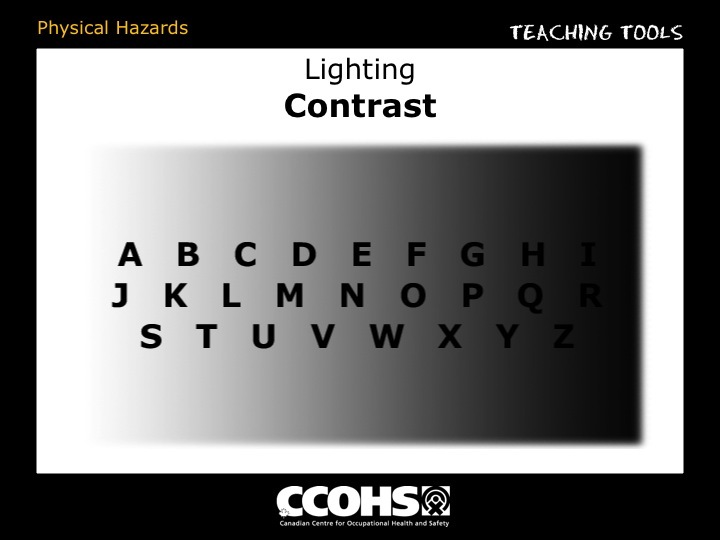 This can impair the worker's vision or distract him/her from their work. To reduce direct glare, shield the light source from the workers line of sight. 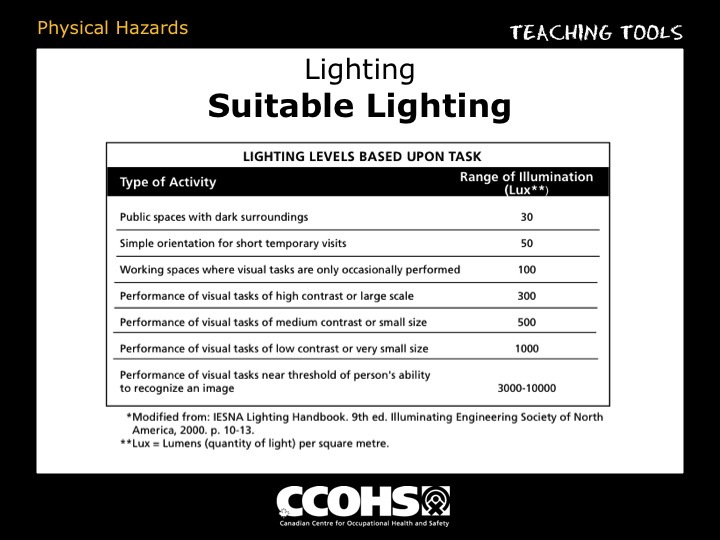 For natural light, this could mean the installation of blinds, and for other light sources, this could mean using lamp shades or other similar devices. 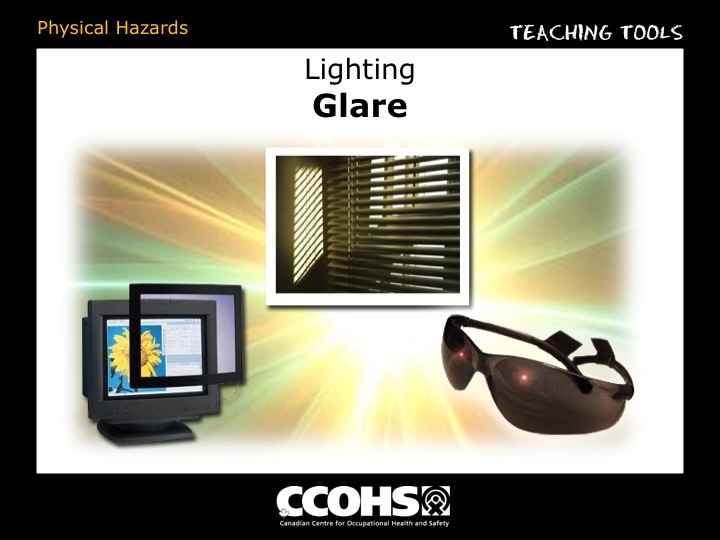 Indirect glare occurs when bright light is reflected from a nearby surface into the worker's eyes. This normally occurs because the background of the work surface is composed of a dark and glossy or shiny surface. For indirect glare, move lighting sources or move the worker away from the light source. Also, alter any dark or shiny finishes to those that are light or matte. Poor contrast makes it difficult to distinguish an object from its background. To remedy this situation make the object bright with light decreasing as you move away from the object. By doing this you will also reduce the chance of observing indirect glare. Light should be distributed to avoid the creation of shadows and glare while maintaining appropriate brightness and contrast of the work area and object. 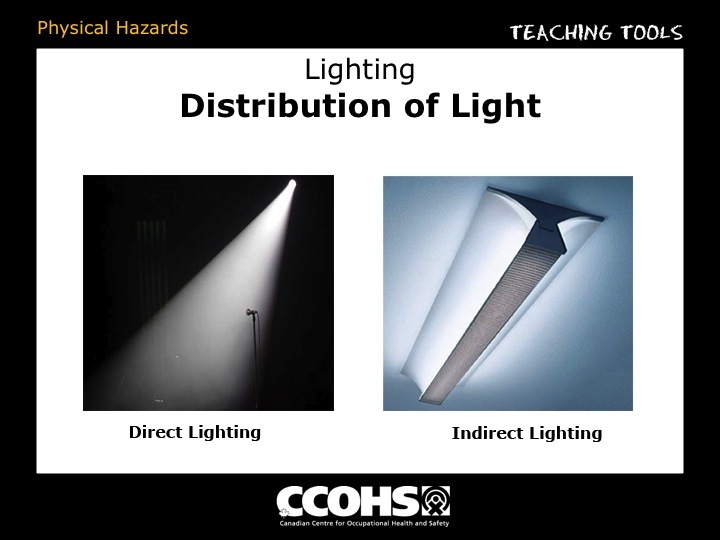 The use of direct and indirect lighting can be used to accomplish this. 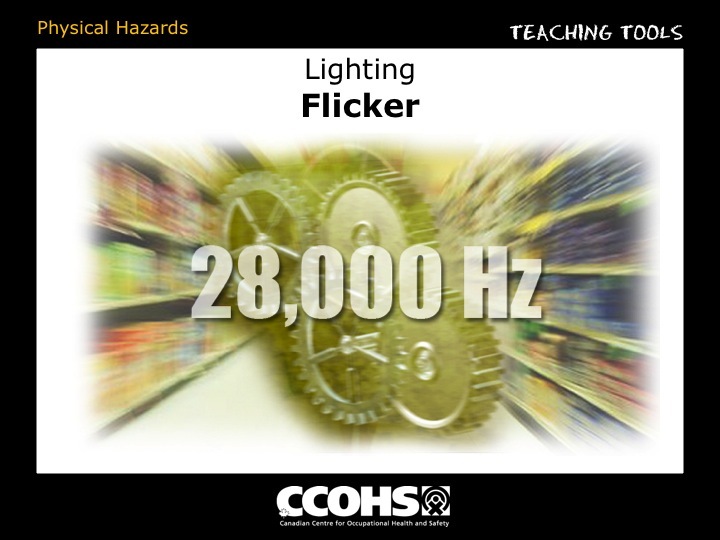 Flicker is problematic because it quickly causes eye strain and induces headaches. Flicker is especially dangerous around moving machinery. Flickering light may make the machine appear to be moving slower than it actually is, or may make it appear to have stopped when it hasn't. 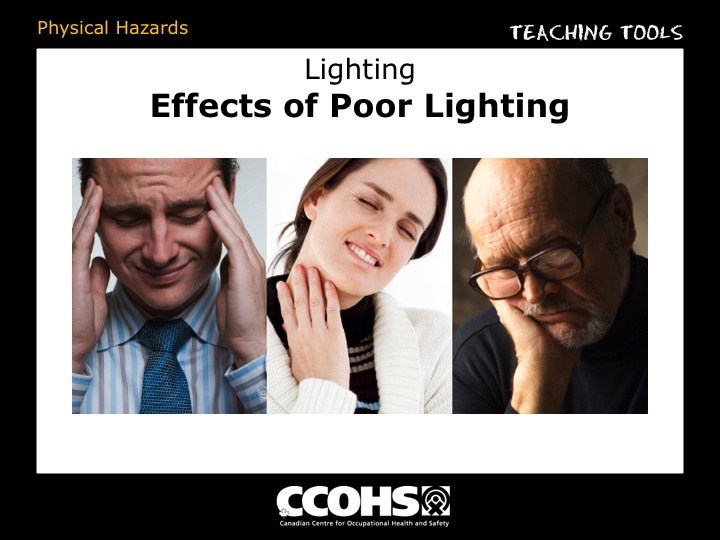 To remedy this, place the lighting on its own high frequency electrical circuit (28,000 Hz).